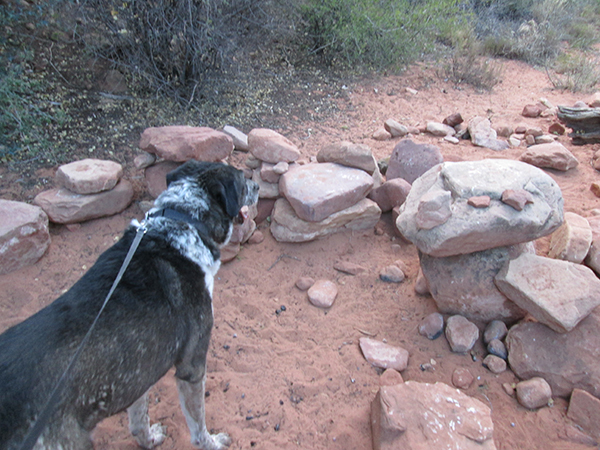 A long time ago some strange rock piles appeared where the boys used to hang out near my trails. Those rock piles stayed in that spot for a very long time. And more and more rock piles showed up there. There were so many that I don’t think anybody could walk around there anymore. I was going to check it out but my person wouldn’t let me. 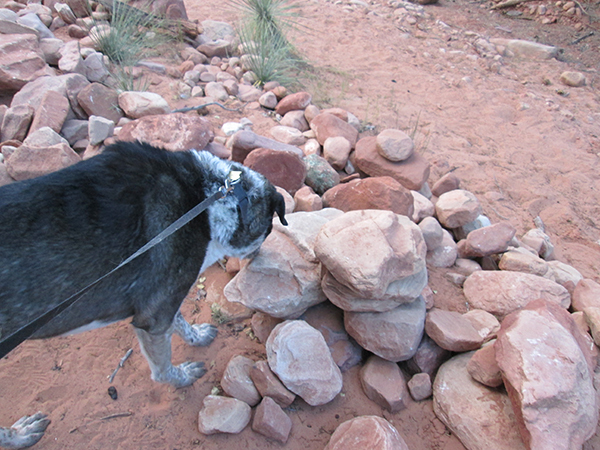 She said those rock piles were taller than me and a rock might fall on my head. I’m not sure why she was worried. She says I have a hard head. I think it was just her excuse to keep me away from there. But today, as I walked by that spot things were different. The rock piles had shrunk – and some had gone away completely. Guess I’d better check for clues. I’ve got to know what happened around here. There are so many mixed messages around here that I’ll never sort it all out. Guess I’ll just leave one of my own. good for you bongo I need to start doing that, marking my territory, Old cissy does it all the time. Fredrieka, I’ve got to mark my trails regularly. Everybody needs to know they’re mine. Fredrieka, I’m heading for the airport right now. Hmmmm. I hope someone leaves a pee-mail answer for you. Check it out again tomorrow, B. Maybe someone will respond to your message and help solve the mystery. Sometimes 2 dogs are better than one. Patricia, I sure hope I get some help with this one. Sun, I may have to get my Detective Dog hat on for this one – or better yet, a hard hat. You are so silly Mr. Bongo! But you must listen to your human, rocks can be very dangerous. Viciously Sweet, I guess it’s a good thing someone shortened those rock piles. 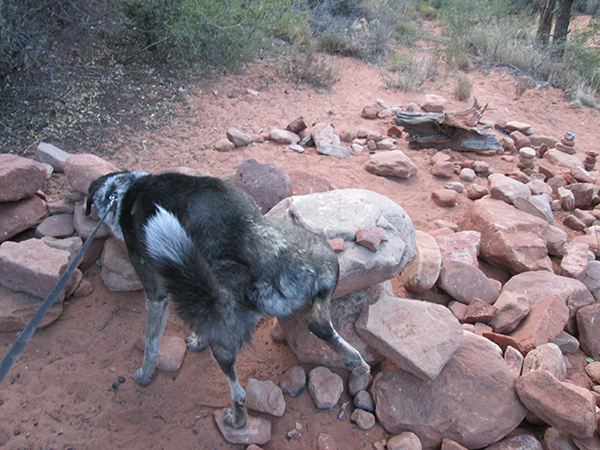 Dalton, people are always making rock piles on the trails around here. I think it’s a New Age thing, and then some people probably build rock piles because they see others and think it’s the thing to do. In some places other people come along and take the rock piles down. PS Of course you are head strong [like a wise dog should] but that doesn’t mean you have to test it!!! Marina, as long as someone doesn’t make those rock piles tall again I guess I’m safe. Hmmm….mystery….I wonder who left those messages……..still haven’t got any answer? Angel Kevin, it’s such a mystery. And the rock piles are getting taller again.